This petcock fits Gy6 49cc-250cc enginge of Go Karts, Mopeds, Scooters and ATVs of Blade, Kinroad, Twister Hammerhead, Carter Talon, Dazon, Roketa, DUNE 150, Baja 150 kart, Kasea, KPX, SUNL, Aimex, Alpha sports, Avanti, Bam X, Baotian, Bashan, BMS, BMX, Boreem, Eagle, CF Moto, Cross Runner, Cool Sports, Diamo, E Ton, Eagle, Fushin, Fly, GMI, Hensim, Hi-bird, Baja, Ice Bear, Jackel, Jet Moto, JCL, Taotao, Peace, JM Star, Jonway, Kazuma, Keeway, KMD, Kymco, Lance, Lifan, Linhai, Loncin, Longbo, Fuxin, Maxtrade, MDI, Meitien, Motofino, Motorino, NST, Panterra, Panther,Qlink Yiben, Red Streak, Redcat, Roketa, Schwinn, Seaseng, Strada, SYM, Tank, Terminator, Tomberlin, TNG, United Motors, Vento, Verucci, Wildfire, X-Treme, Yamati, ZNEN, and Zongshen and etc. Please check the picture before you buy. 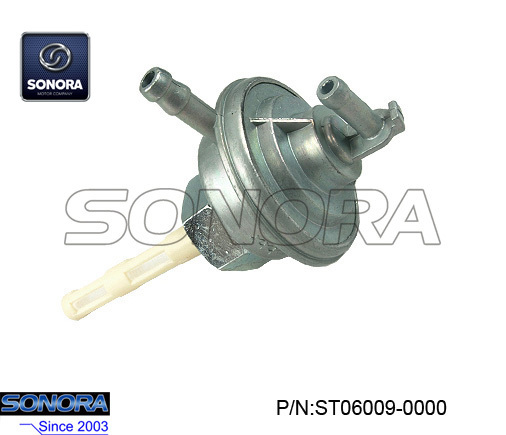 Sonora Motors can supply all the Chinese brand motorcycle and scooter parts, such as Throttle Cable, Speedo Drive,Lock Set,Muffler And Exhaust,etc.Once you have needs in scooter Vacuum Tap Valve Petcock, don't hesitate to tell us. Looking for ideal GY6 Scooter Fuel Switch Manufacturer & supplier ? We have a wide selection at great prices to help you get creative. All the GY6 Scooter Petcock are quality guaranteed. We are China Origin Factory of GY6 Scooter Fuel Tap Valve. If you have any question, please feel free to contact us.